I conduct a lot of instructional workshops before my shows when I am on the road. A question that comes up very often is, How do I go about writing a piece of music for fingerstyle guitar? This is a such a big question that I’d like to break down, over the next few issues, the different approaches and devices I use for writing instrumental fingerstyle pieces. The principal concept in my compositional approach is what I call “melody first.” For a moment, let’s forget our preconceived ideas about music and think of it simply as something comprised of just two fundamental elements: melody and harmony. Melody and harmony equal music, and all of the extra stuff I like to include—the percussive elements of hitting the guitar, crazy strumming, etc., is all “extra.” These things are not what I consider “integral” to the core emotion of the piece of music at hand. First off, I often play in DADGAD tuning, which is what I am using for the examples in this first column. As the name implies, the guitar is tuned, low to high, to D A D G A D. The melody is the “top line,” as demonstrated in FIGURE 1. This is a very simple melody based on the D major scale (D E F# G A B C#). The harmony is provided by either a bass line or chordal references that, when combined with the melody, create a musical feeling. Oftentimes, when I first pick up the guitar to write a piece of music, I will start with the basic melody. Let’s now add some bass notes in order to create the harmony that will lay the groundwork for our song: in FIGURE 2, I add a B note on beat 1 to make reference to Bm, and then descend to A and then G, and then back to A. We now have harmonic reference points that serve to make our melody sound much more interesting. Keep in mind that we could easily use different bass notes, such as those shown in FIGURE 3, to create a very different musical feeling. The next step, for me, is to exaggerate and embellish the bass line. When playing solo acoustic guitar, it’s very important for me to try and approach the bass line in the same way that a bassist would. This is demonstrated in FIGURE 4. In FIGURE 5, I’ve added notes between the bass line and the “top line” melody to create a more intricate piece of music. Work through this part slowly so that you will hit these bass notes and “inside” parts on the correct downbeats and upbeats. 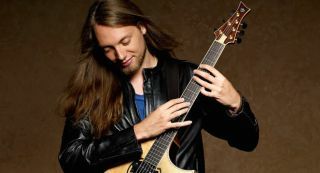 Mike Dawes is an English guitarist and touring musician, hailed as one of the world's most creative fingerstyle performers and renowned for his ability to seamlessly replicate a full band on a single instrument. For more information, visit mikedawes.co.uk.